Distribution and transportation metrics program allow the company's logistics management to make better-informed transportation decisions using true load visibility, locate shipping bottlenecks, reduce shipment delays, and reduce administrative and support costs by increasing productivity through early identification of problem shipments and reducing human error. Besides, efficient measurement program is crucial to achieve collaboration among shippers, carriers, and consignees involved in various logistics processes. Metrics data is often the best means of identifying the areas in logistics operations requiring attention and should be the main driver for directing the capital spending of the organization. Transportation expenses can be significantly decreased if transport's used efficiently. Evaluation of transportation kpis will definitely help. Evaluation of administrative expenses related to shipping will help decrease overall transportation budgets. Transportation kpis will help reveal reasons for shipping delays and eliminate them. Areas requiring additional attention can be easily revealed. Download trial version of Transportation Indicators. Purchase full version of Transportation Indicators + bonus. Transportation segment is related with translocation of people and goods from one place to another. This area can be divided into three subsets- vehicles, operations and infrastructure. Various modes by which transport is conducted are- 'air', 'rail', 'road', 'pipeline' and 'space'. Organizations are often required to take care of such movements of resources so as to make available the right resource in right quantity at right place. One can do justice to all the aspects involved by using a management concept called BSC (balanced Scorecard). It relies on the metrics that are decided for after studying the concerned field in an enough detailed manner. Saying it all, one can utilize the components of transport domain by logically allocating the resources to their usage. The right collection of indicators helps in this regard as one can assign values and numbers to those and keep for further consultations. Deviations can be spotted well within time and correction procedures be implemented to come out of the trapped situations. In all, by taking help from BSC, one can calculate the steps and judge whether the actions have been occurring in the intended manner or not. Related metrics and KPIs for: Supply Chain, Inventory and Warehousing, Logistics, Custom Office, Travel Agency, Procurement. Customers who viewed this item also viewed: Just in Time Manufacturing Scorecard | Airlines Scorecards Pack | TQM - Total Quality Management. 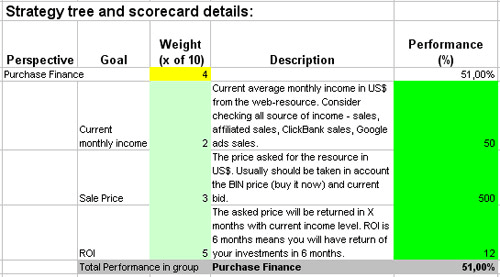 This is the actual scorecard with Transportation Indicators and performance indicators. The performance indicators include: balanced scorecard designer, time spent picking back orders or stock-outs, rate of stock-outs, return on investment, customer perspective, process management, asset management. Download a trial version of Transportation Evaluation Balanced Scoreboard or purchase a full version online.